After Friday's test day, the ArmsUp cars were solidly placed with four cars in the top-ten in Formula Continental. Jose Paredes also established himself in the Formula Atlantic field with his Swift .014 in the top-ten after the practice day. Qualifying would confirm the speed showed by the ArmsUp Motorsports cars with the younger Greist earning the best time of the team; lining up fourth on the grid after the two qualifying sessions. Kindsfater, John Greist and Victor took grid positions six through eight. Each of the ArmsUp cars gained significant time in the second of the two qualifying sessions. Walter Vollrath and John Dickmann each gained over two seconds in second-round qualifying to start in the top 20 of the FC race. Jose Paredes was forced to stand on his qualifying one time after a problem forced a short second session. 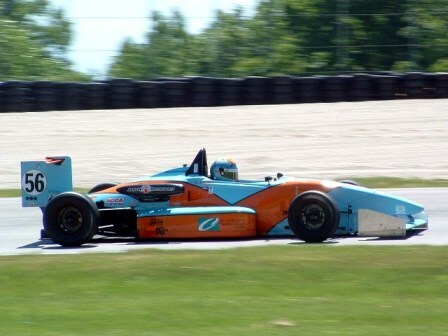 His first time was still good enough for tenth in the tough Formula Atlantic class. Sunday afternoon rolled around and the ArmsUp crew was looking towards the sky before the start of the race. The green flag flew under increasing cloud cover but the rain stayed away to produce an exciting event. At the start, Kindsfater got caught out on turn one and went off, dropping several positions. Greist and the rest of the team got away clean until an early race full course caution came out, bunching the field back up. Once the green came back out, the field began to stretch as the race reached its half way point. Just past half way, Greist found himself in a dog fight for second place after picking up one spot. John Greist, who had moved into the fifth position was feeling pressure from teammate Jim Victor as the duo tried to chase down the fourth place car. Kirk Kindsfater began making up time from his early off and was back into the top-ten. John Dickmann ran a steady race and was moving up positions while Walter Vollrath had an early race spin, but was making progress through the field past the mid point of the race. With the laps winding down, Jose Paredes was running solidly in the eighth position. Unfortunately the Illinois driver had an off-course excursion that damaged the car and ended his very promising run early. Revere Greist continued to apply pressure for the second position but would come up just short, crossing the line third; the Madison, Wisconsin driver's first SCCA National podium finish. Greist's father, John, would cross the line fifth, a fantastic result after a tough early season for the driver of the number 61 car. Jim Victor continued his consistent run at the June Sprints scoring a sixth to back up his fifth-place finish in 2007. Kirk Kindsfater worked for his seventh place finish after falling back early and battling his way back toward the front. John Dickmann continued to show improvement in his bright-yellow Van Diemen by driving to a 14th place finish. For Walter Vollrath, who made his first start this season, a hard fought 17th place-finish would be well earned after an early race spin. "That was an exciting race," Revere Greist stated after his first podium finish at the Sprints. "This is a great event and I look forward to coming back here for many years and moving up a few steps on the podium. The finish is a testament to the ArmsUp team for giving me a great car everyday we were here. We made a lot of progress which will help us move forward the rest of the year." "I think this is one of the best Sprints we have had," team owner Gregg Borland would say after the race. "We had four cars in the top seven in FC and could have had a top-ten on Atlantic. All of our guys drove very well, the crew worked very hard to overcome some early issues to give each driver a competitive car. I want to thank all of our friends and family that came out to support us this weekend." ArmsUp Motorsports now takes a short break and will be back in action at Road America. Walter Vollrath is scheduled to take debut his 1978 Lola 497 at the Kohler International Challenge July 19-20.